An application overview is a page that aggregates high-level information, such as supported channel interfaces, case types, or data types. 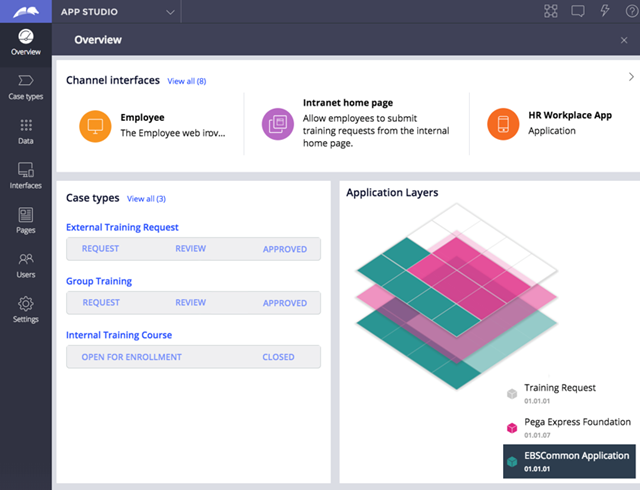 By using this page to find and monitor the key components in your application, you can make informed decisions about how you want to allocate your development resources. For example, you can compare the life-cycle stages in your case types to identify inconsistencies and opportunities for reuse, or review your channel interfaces to find new ways to engage customers. The following figure illustrates the organization of overview information for a human resources application. Encourage your project stakeholders to periodically review your application overview, so that they can stay informed and require fewer status updates. For more information about projects in App Studio, see Getting started for business analysts and development teams.